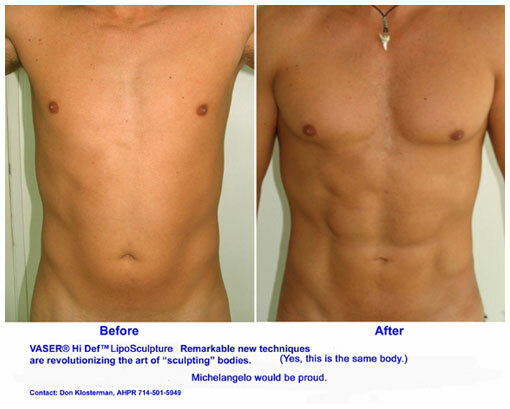 VASER Assisted High Definition LipoSculpture, or VASER Hi Def, is a body sculpting technique used to create a well-defined, athletic appearance in the patient. Being very precise, the procedure removes fat from around the muscle groups to enhance their definition. VASER Hi Def factors in the form of the musculature under the skin and works with it to create a sculpted appearance. The patient best suited for this procedure is one who is already healthy and fit, and maintains such a lifestyle, but may not be able to gain the definition they desire due to age or pregnancy. VASER Hi Def is not for removing fat, rather, for sculpting the body. VASER Hi Def can be performed on multiple body areas including the abdomen, female breast, male chest, back, arms, thighs, buttocks, hips and waist.